E30 is one of the most loved BMW‘s in the world. It is not immediately obvious why, but it is a nice car to look at. It features straight sharp lines and right angles. It is compact, yet athletic in a way. E30 is just full of character, which helped it to gain its international success. Today we present 7 interesting facts about E30 that you might not know. BMW E30 – is the second generation 3 Series, produced between 1982–1994. In total, more than 2.3 million examples have been made, which means that the E30 is far from being a rare car. This is actually good, because people can modify it to suit their personal taste without remorse of damaging some historically valuable vehicle. In Nodum.org you can follow one of these projects – Martynas‘ E30 Coupe is getting restomoded into something rather interesting. But let’s jump into the 7 interesting facts about the E30. BMW Z Series is a family of convertibles. You probably know the little Z3 and you have definitely seen the pretty Z4. 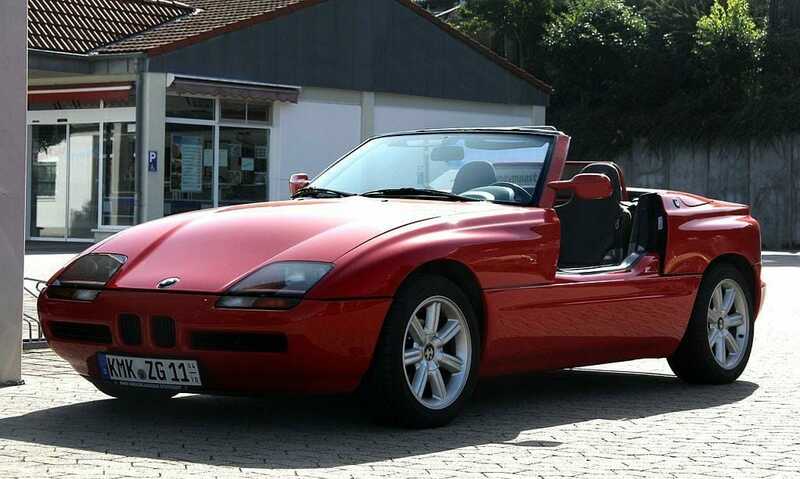 However, the first Z car was actually the small and quirky Z1, based on the E30 325i running gear. It had a plastic body, an interesting shape and bizarre vertically opening sliding doors. BMW M3 is now an iconic performance car, which we can trace back to the E30. BMW wanted to race, so the E30 homologation had to be passed and, as you know, street cars are needed for it. That is why in 1985 the E30 M3 was born. It was built using a coupe body, but arches were expanded using a boxed design. Some people like it and some people don’t, because it looks like a modification done in someone’s garage. The most powerful E30 M3 had a 175 kW 2.5 litre engine and could reach 100 km/h in around 6 seconds. The last E30 M3 was made sometime in 1992. M3 is a very practical performance vehicle. But making it into a pickup just doesn’t sound good. However, the only M3 pickup produced by the actual M Division was meant to be used in the facility to deliver parts. It was made in 1986 by converting a normal 3 Series convertible into a performance pickup with a 2 litre engine. Later it got a proper 2.3 litre engine and it was still being regularly used in the M Division campus until 2012. Many enthusiasts created their own E30 pickups as well. Many historians and BMW fans agree that the E30 helped BMW transition from building small sporty cars to larger luxury automobiles. E30 was the first 3 Series to be offered as a sedan and as anestate. It was also the first 3 Series to have an all-wheel-drive and diesel engine options. And the first BMW to sell in big numbers in the U. S.
E30 was being manufactured up until 1994, but its successor, E36, entered production in 1990. How can it be? Well, at first, E36 was only made as a coupe and until other versions were made available, the E30 was still being manufactured. It was slowly phased out. Touring (estate version of the E30) was the last E30 to leave the factory in 1994. E30 is actually not an expensive car at all. Many car enthusiasts bought them and started modifications without knowing what they were doing. For example, bricks or a concrete slab in the trunk are known to have been used to improve the handling. Nowadays, it seems that people who pick up a E30 for restomoding projects modify their cars tastefully and such weird fashions don’t exist enymore. E30 convertibles were featured in Top Gear as well. The popular trio tested three almost identical cars, but two of them were badly modified. And so, the least modified one won the challenges by a huge margin. E30 was designed by the German car designer Claus Luthe. He is regarded as one of the most important people forming modern European car design. In his portfolio we would find not only E30, but also Audi 50, BMW E28, and Volkswagen K70. Have you ever been in an Audi 100 C2? Its interior also has been designed by Luthe. He also supervised the design process of the E31 8 Series. Those are all the facts we compiled for you for today. We invite you to follow our series of articles about this E30 – Martynas’s E30 is taking shape nicely. Did we miss something? What other important E30 facts have not been mentioned in the article?